In the previous tutorials we learned about the factory methods introduced in Java 9 to create immutable List and immutable Set. 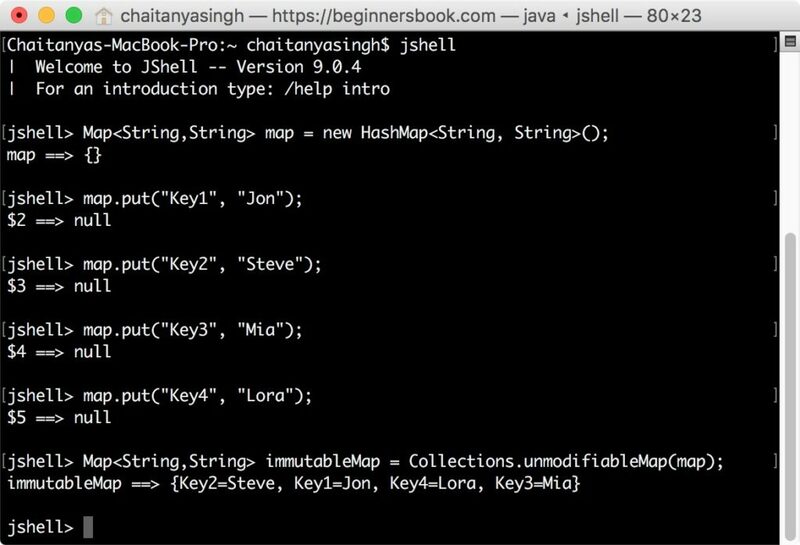 In this guide, we will learn how to create immutable Map and Map.Entry by using Java 9 Factory methods. Before we see how to create immutable Map using Java 9 factory methods, lets see how we used to create them before Java 9. We used to use the unmodifiableMap() method of Collections class to create unmodifiable(immutable) Map. Lets test this in JShell. There are couple of useful factory methods introduced in Java 9 to create unmodifiable Map. We will take the same examples that we have seen above to compare how things got easier in Java 9. The lines of code that we had to write prior to Java 9 is reduced drastically with the help of factory methods. To demonstrate the use of Map.of() factory method, we have taken the same example that we have seen above using unmodifiableMap() method. As you can see how simple it is in Java 9. We have reduced the 6 lines of code in a single line. What is an immutable Map? 1. Immutable Map doesn’t allow addition, deletion and update of its elements. If you try to perform these operations then the program will throw UnsupportedOperationException. 2. They do not allow null elements. Adding null elements will throw the same UnsupportedOperationException.